The air quality in Dutch classrooms is terrible and this has a major impact on educational achievements, concentration, wellbeing and behaviour. Sufficient research has now been conducted to convincingly demonstrate how bad the quality is and how important good air quality is. The good news is that research has also been conducted which convincingly demonstrates how much improvement can be realised simply by placing a few plants in the classroom. Fresh air? Open the windows. It’s no surprise the air quality in a small room with 30 students is going to come under pressure. The air isn’t refreshed quickly enough, which means the CO2 content increases and the humidity decreases. Plus various different types of waste matter will quickly build up too. Students become drowsy because of the bad air quality, something which obviously isn’t going to benefit their educational achievements, but which is actually also bad for their health. The simplest method of combating bad air quality is to open a window. But this certainly isn’t always possible because of noise levels or cold temperatures. Research conducted at Healthy Schools (Dutch) has demonstrated that the situation across all Benelux countries is pretty dire and that the air quality in classrooms is often much worse than it is in, for example, offices or even prisons. The government is also becoming increasingly aware of the problem. At the website Healthy School (Gezonde School) schools can find all sorts of different ways to make their school healthier. Schools can qualify for the ‘healthy school’ vignette here too. Schools can also apply for (limited) financial support via the Government or via local and regional addresses. In June 2013 the minister announced that all primary schools can have a free CO2 meter and that the presence of such a meter will form part of the Building Act for new schools. But of course, measuring alone doesn’t solve the problem. What can schools, often with limited budgets, do about this problem themselves? Plants can definitely make a massive difference. Are plants in the classroom a solution? 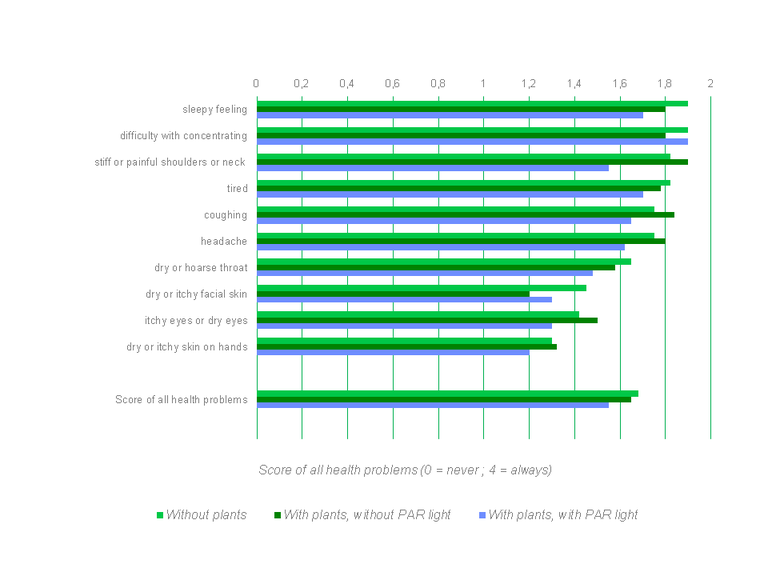 Fytagoras and TNO conducted some interesting research in 2011 into the possibilities for improving the air quality in school classrooms using plants. This may prove to be a relatively cheap and practically executable solution, particularly in existing school buildings. Especially when you consider the problem of stale air isn’t just caused by excessive CO2 levels, but also by a multitude of other particulate compounds. Just think of formaldehyde or benzene. An additional benefit associated with plants is that they can also absorb noise and will quickly put an end to the infamous ‘gym air’ which can permanently hang around classrooms. And classrooms with plants which receive sufficient light. The children were presented with questionnaires before, during and after the period, which asked them questions regarding their health and wellbeing. The children from all groups were also constantly presented with a number of performance tests. For example, they needed to decipher a secret code. And the air quality was naturally constantly being measured both before and during the test period. Degradation of pollutants and “odours” within 45 minutes to 0 level, as a result of the plants’ air purifying properties. 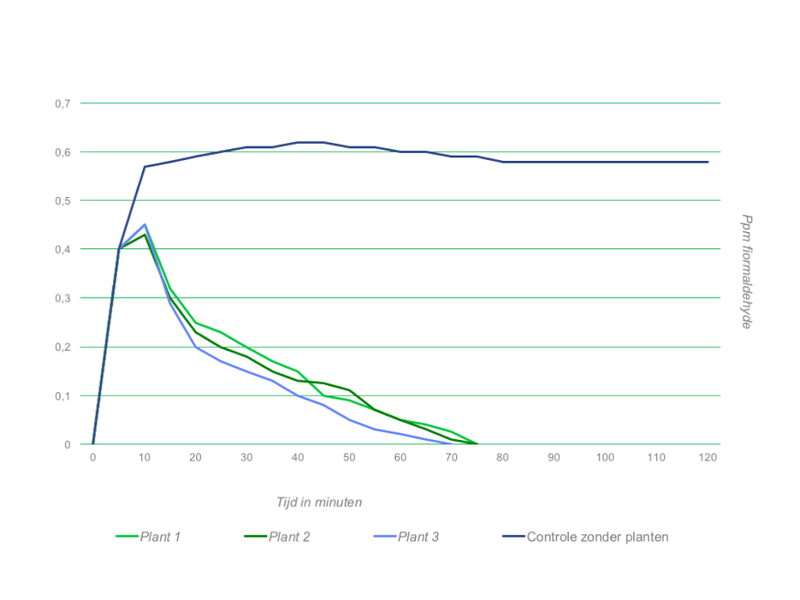 This graph shows the breakdown of Formaldehyde in a classroom without plants, the blue line, and in classrooms with plenty of light and plants (pink/magenta line) and in classrooms with plants with little light, the blue and purple lines. So plants can even significantly contribute to the breakdown of this substance in darker classrooms. The second group also had some interesting results. A great deal of CO2 is still broken down in case of insufficient light, plus the performance levels were also better than in the classroom without plants (an average of 10%), but the breakdown of all other hazardous substances was a slower process. So light is an important success factor. But compared to classrooms without plants, the children in the darker classrooms were still considerably better off. The health measurement also demonstrates that the classrooms with plants, which have sufficient light, enjoy the best scores. Please refer to the following table. The conclusions are encouraging … so now what? Especially in classrooms with sufficient light, plants will very quickly be able to effectively do their job without huge additional costs. But plants can certainly also be placed in classrooms which don’t enjoy a great deal of natural light. In order to achieve the same results in darker classrooms, daylight lamps could perhaps be positioned, or alternatively particulate capturing carpets. Of course some costs are linked to this, but these are often one-off investments, not annual costs. The goverment recommends for a CO2 meter to be placed in all classrooms. This will instantly make the seriousness of the subject ‘visible’. And simply even a few ordinary plants on the window sill will already result in enormous benefits in all situations.